Furnishings and textiles center on the rounded shape. Giotto acoustic panels in polyester, steel wire, and plated steel by Snowsound. Ozone Trevira CS-polyester by Camira. 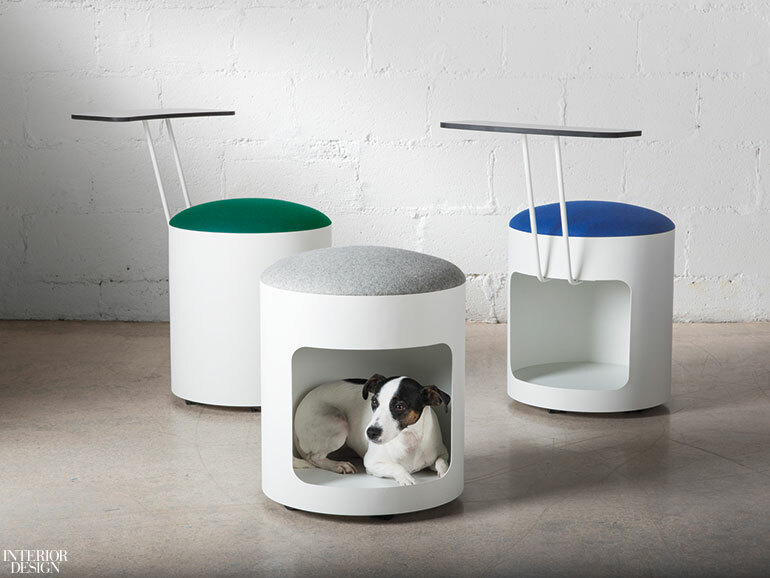 Kutee stools with laminate tablet in painted steel and Kvadrat’s Divina wool in hunter green, heathered gray, and deep blue by David Edward. 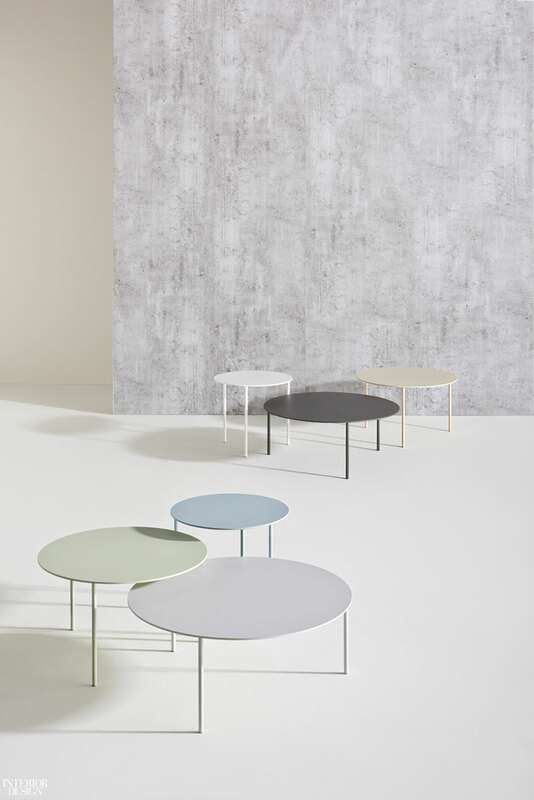 Helio tables in powder-coated steel by Davis Furniture. Jellyfish rug in wool felt by Fraster. Bob ottomans in Kvadrat’s Steelcut Trio wool-nylon by Scandinavian Spaces. Astro lounge chair in aluminum and Architex’s Fibonacci Beluga polyester-Trevira CS by Via Seating. 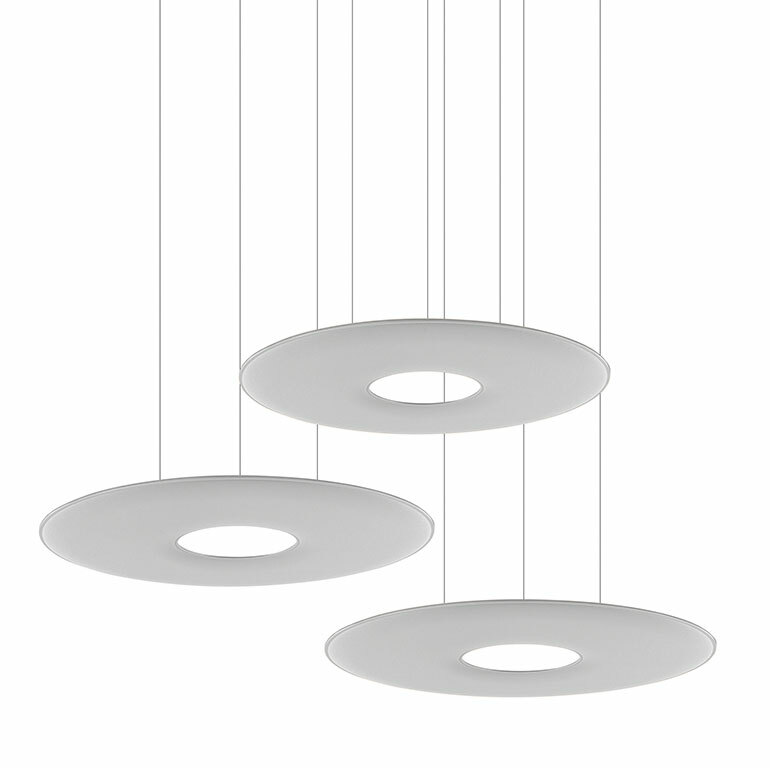 Atmosphere wall covering in thermoplastic olefin and recycled glass in Surround by Knoll. Pininfarina premiered VISION, an innovative kitchen designed for Snaidero, at the 2018 Milan Furniture Fair. The design concept encapsulates the modern urge for fluid domestic spaces, with surfaces that flow and materials that immediately convey a sense of purity and sensuousness. The elegance of Vision is seen in its airy forms and volumes. A lightness conveyed by the unique design of the base units for islands and peninsulas, a refined element developed by craftsmen in stratified and shaped solid ash wood. Art industry experts are saying the era of the billion dollar painting is inevitable, tracking the resurrection of art to its once revered status. The buoyant art market is showing no signs of slowing down, a forecast echoed in the recent sale of Leonardo da Vinci’s Salvator Mundi to the Louvre Abu Dhabi for a record-breaking $450.3m (£340m). Founder of online art price database Artprice, Thierry Ehrmann, expects a “firm and durable growth” in the industry internationally. In the UK alone, the art market contributed £1.46bn to the economy in 2016, a comparatively slim figure you consider the net-value of its sales, which totalled £9.2bn. But how does this translate for the consumer; the homeowner with an art collection comprised of inherited paintings, a commissioned piece or two, and a selection of glitter-clotted, handmade pasta frames? While very few of us will be working to a budget similar to that of the art buyer for the Louvre Abu Dhabi, we still want to invest our money wisely in pieces we love. Art is fast becoming recognised as an essential component of a modern home, with influencers and interior designers singing the praises of gallery walls and the like. If you speak to almost any interior designer about the importance of art in the home, you’ll be met with a resounding, excited flurry about the inspiration it provides, the way it lifts a space, or the joy that comes with sourcing works from around the world. However, this is not the full extent to the intermingling of the art and interiors industries. For homeowners, interior and product designers alike, art is paramount, powerful and primary. 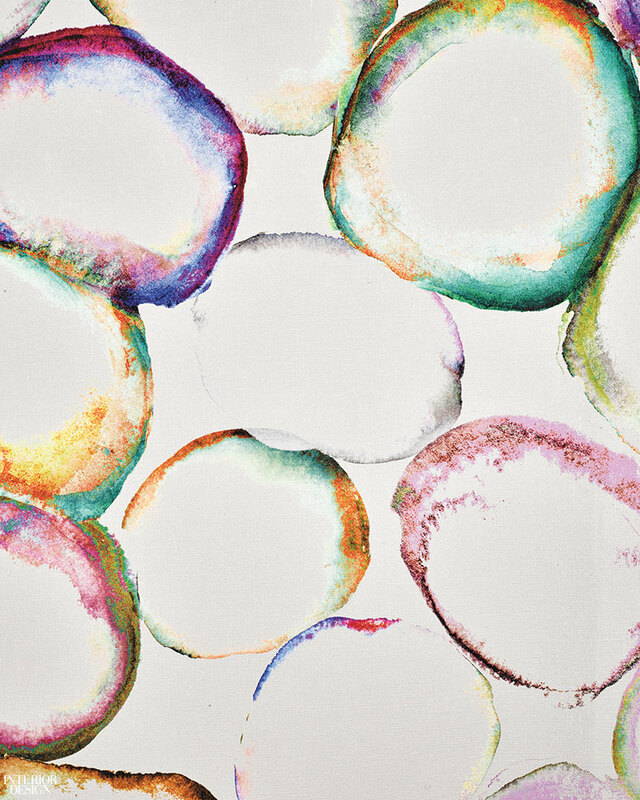 Homes and interiors brands are also embracing the consumer’s urge to fill their homes with art by working closely with artists and galleries on collaborations, or taking it into their own hands to create branded artworks. 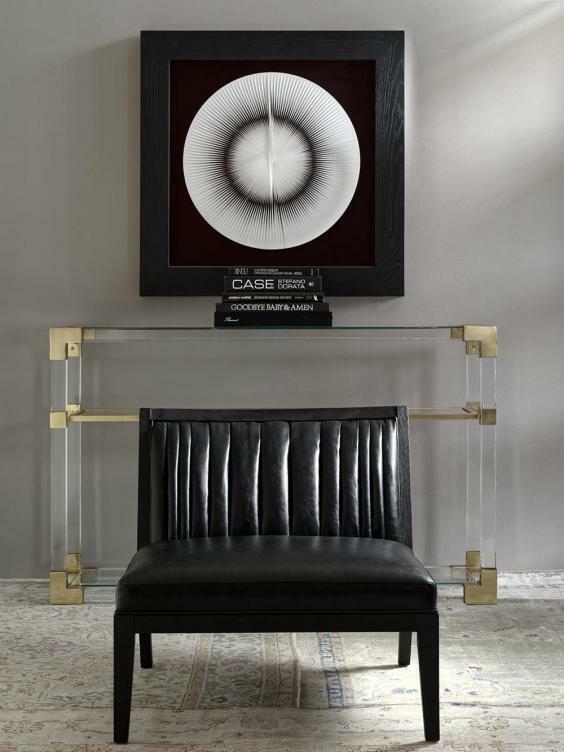 For example, Andrew Martin has introduced a collection of exclusive artworks to supplement its vast, vault-like archive of furniture, cushions and objet d’art (all readily discoverable at the Walton Street showroom). The collection includes a series of three-dimensional, diorama-like artworks displayed in box frames. The intricate works reimagine the essences of everyday objects, grouping and distorting them to create eye-catching, textural works to add a sense of tactility to an interior scheme. The notion of art designing a space implies that you can base the design of an entire room on a piece of art, from the colours to the fabrics and finishes you specify. Godrich Interiors is a London-based interior design studio with a strong artistic focus in all its projects. Co-founder and creative director Ed Godrich believes art is vital to the creation of a scheme. “Art is always our starting point for designing an interior space, so it’s very personal,” he says. The same is true, it seems, for product designers. Art need not always be displayed in a box frame, on a canvas or perched on a stone plinth. The design team at Sheridan Australia has taken it upon themselves to create beautiful collections of bedding inspired by commissioned artworks by in-house artists. “The designs for our collections are created as artworks – they’re not engineered textile designs but genuinely art on the bed,” says Joanna Ross, general manager of design at Sheridan. For each seasonal collection, Sheridan sends a team of artists to an area of outstanding natural beauty in Australia to paint and draw from the wildlife and the landscape. For the SS18 collection, the team of artists travelled through South Australia, from the ancient Flinders Ranges to the tropical peaks of Mount Gambier to take inspiration for a light, airy and painterly look. The sketched and painted designs are digitised in the Sydney design studio and printed onto the linens for sale in the UK and in Australia. Art and interiors are inextricably linked in complex aesthetic and emotional ways for designers and homeowners. The focus on (and value of) art in new projects and product launches is obvious. From the imminent billion dollar price tag on the next Da Vinci, Picasso or Hirst piece up for auction, to the recent addition of affordable art collections to high-street retailers like Oliver Bonas, consumers at each end of the financial scale, have become curators. Home decor is quickly becoming an “it” industry in 2015. Once dominated by big-box retailers and independent interior designers, the home decor industry is undergoing a sea change and a few innovative startups are leading the charge. Home furnishings shoppers used to start with the likes of Ikea, graduate to, say, West Elm and eventually dabble in Williams-Sonoma or Restoration Hardware. Now with tools like Pinterest and design blogs providing endless inspiration and access, there are a lot more choices, variety and experimentation. And creating a coherent, polished yet personalized aesthetic no longer requires an expert eye, bundles of free time or a hefty disposable income. Entrepreneurs have entered the decor game and things are heating up. Home furnishings is a $79 billion industry, according to IBIS World as of December, and that space is attracting innovators and investors alike. Last month housing starts reached their highest level since 2008, according to the Department of Commerce, demonstrating growing consumer confidence and a renewed interest in home investment. Historically, professional interior design was an expensive luxury. Luckily for consumers, though, hiring a designer just became affordable with new online business models, standardization and price transparency. A new bespoke decor service that claims to be “changing the design industry one interior at a time,” Homepolish matches clients with local interior designer talent (based on zip code), available for hire by the hour, at a reasonable price. A one-hour consult in the customer’s home is available at a cost as low as $50. 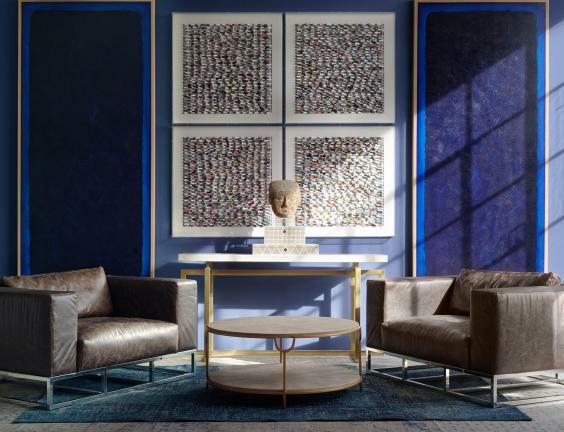 Founded in New York City in 2012, the online company standardizes the process of working with interior designers, wholly disrupting a traditionally word-of-mouth industry. The business-savvy leadership team claims to have a hefty roster of celebrity clients to kick its visibility into high gear from the start. Catering to tech-aware clientele, Homepolish leverages tools like Pinterest and invites customers to follow its Instagram account for inspiration. In home décor, crowdsourcing is just catching on. Laurel & Wolf takes the practice of contractors’ bidding on a project to the next level. A customer submits photos of a space online and receives design ideas and style boards from multiple designers around the country. Once the consumer chooses a favorite design, he or she receives a personalized floor plan and shopping list along with instructions on how to DIY the space from the before to the after. Founded in Los Angeles in 2013, Laurel & Wolf has attracted $1.1 million in seed funding, according to Crunchbase. One challenge in home decor is making decisions. There are millions of products to choose from, so consumers rely on heuristics to help them commit. Customers like style profiling to help them articulate preferences and narrow down the scope of choices. 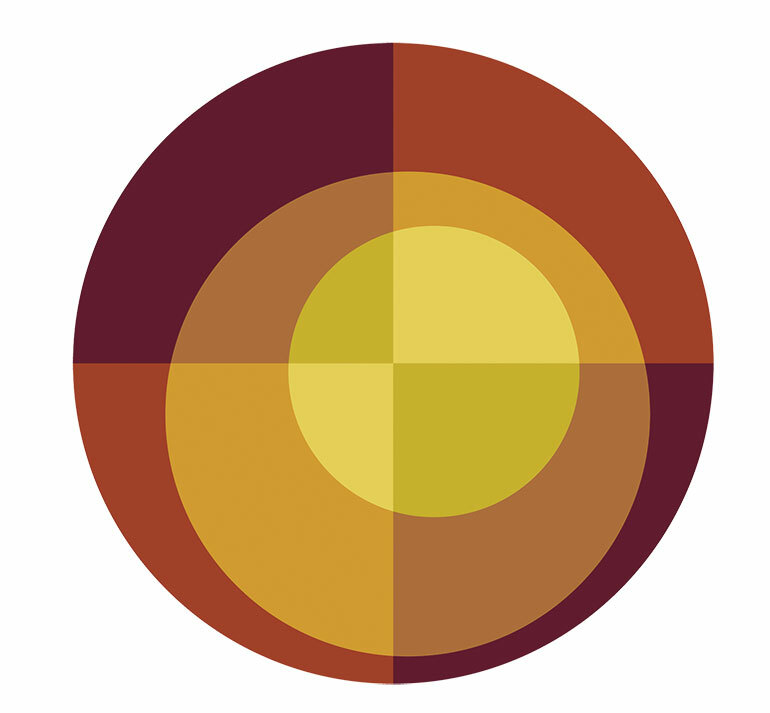 Tastemaker, of San Francisco, provides an “e-decorate” service by using a questionnaire that helps customers define their taste. More than just a gimmick, the ecommerce site’s genius then recommends products and interior designers the customer would like, and, I’ve been told, the results are spot-on. The service quickly became popular so it’s currently not accepting new client projects. I believe there’s still plenty of opportunity for an e-decorate service that helps consumers define their style and merchandises products based on the result, either through an affiliate model or straight ecommerce sales. 4. Cutting out the middle person. Slicing out the middleman is in vogue these days and the home decor industry is no exception. As is the case with many industries, home decor has a long supply chain. Several new startups are remodeling this supply chain and bringing down the price tags. 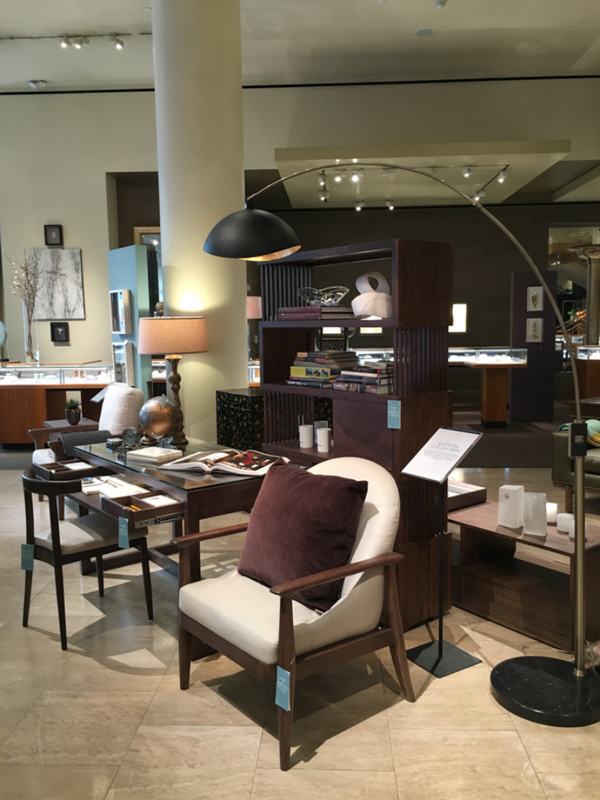 Two new companies work directly with makers and manufacturers to provide quality designer furniture, resulting in more affordable prices for the shopper. Interior Define is one such online furniture retailer that works directly with makers and manufacturers, providing designer furniture without a retailer markup. Based in Chicago and founded by a former Bonobos ecommerce veteran, Interior Define has attracted $3.2 million in funding since its start in 2013, according to Crunchbase. Bonobos founder Andy Dunn is one of the company’s advisors. Bryght is another player, with headquarters in Vancouver. Founded in 2011, the company claims to have prices as much as 70 percent lower than typical retail ones. For the shopper who likes a treasure hunt, several new resale sites are cropping up, all with a similar offer: well-curated, high-quality, affordable pieces that are “gently used.” It takes time to comb through the inventory, but the end result is home decor with a unique story behind it. Chairish, founded in 2013 in San Francisco, and Viyet, launched in New York City in 2012, are vying for the lead position. I liken it to the Uber-Lyft scenario. AptDeco is a smaller player in New York City, but just expanded its service to Washington, D.C., Boston and Philadelphia. Many entrepreneurs today know product marketing can involve more than selling a product: It can sell a benefit. In the case of home decor, the benefit is the lifestyle that comes with the chair. Many decor companies are changing their merchandising strategy and organizing products by theme rather than category. 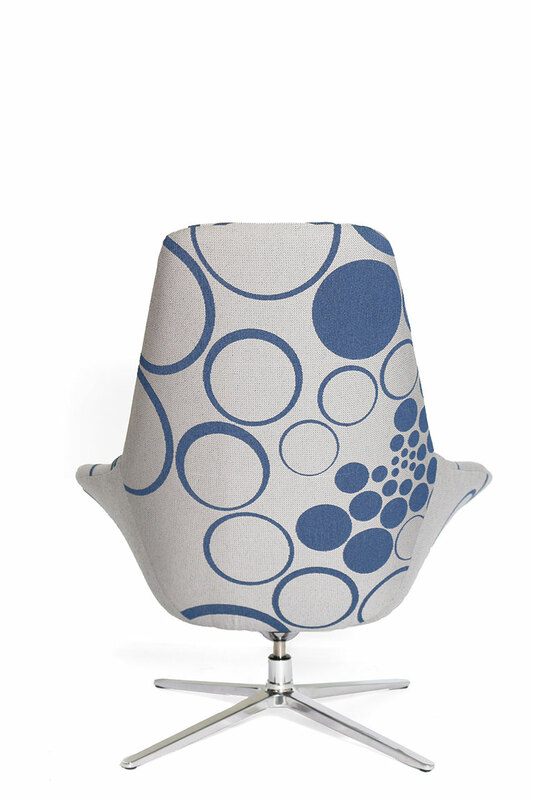 Dot & Bo launched in San Francisco in 2013 as an online furniture seller. The company is positioning its site to become a lifestyle brand as well as a source for content, having recently hired media and entertainment veteran Nancy Tellem. Its collections are centered around creative themes, making it easy for someone to create a coordinated look to match a lifestyle. For the hands-off shopper looking for convenience, companies can provide entire rooms for sale that look professional and polished. MACK is one such company, taking the staged-room concept a step further by offering fully designed rooms for sale at the click of a button. Launched in San Francisco in 2013, MACK aims to replace the need for an interior designer altogether and solve one of the biggest challenges consumers face when decorating — being able to envision the complete, finished look of their home. I was so excited about MACK’s approach to design that my company, UGallery, has partnered with it to offer original art in rooms. Belgian luxury rug manufacturer Louis de Poortere has partnered with British design house Romo – one of the fabric industry’s leading brands – to bring to the market a capsule collection of flatweave and handtufted rugs inspired by Romo’s trendsetting textile designs. Romo is renowned for its assorted library of classic and contemporary fabrics and wallcoverings, enriched with a sophisticated colour palette. In an exclusive collaboration, Louis de Poortere has expertly translated a selection of Romo patterns into exquisite, luxe-look rugs in colourways that are in tune with today’s interiors. The eye-catching collection includes on-trend geometrics, tribal patterns and subtle abstract patterns, presented as sumptuous hand-tufted 100% wool or wool-mix rugs with a rich, deep, luxurious pile for comfort underfoot, or flatweave rugs in soft cotton chenille that incorporate subtle variations of colour and intricate textural details. 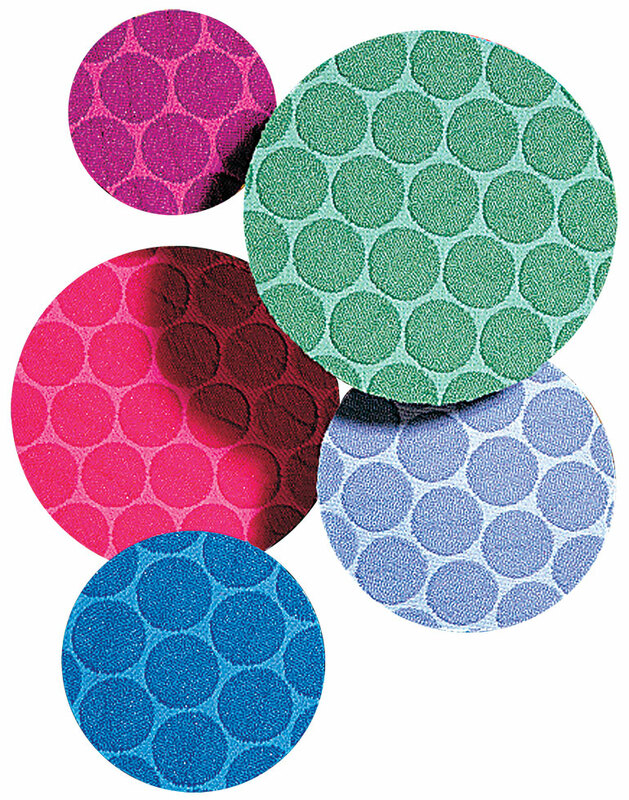 Available in three popular sizes and backed with anti-slip latex, the flatweave styles include Murano, a painterly brushstroke design with a mid-century feel in gris and sunflower colourways, and Lomasi, a contemporary oversized floral pattern with a distressed effect, which comes in cool steel blue or dramatic charcoal. The hand-tufted rugs feature a 100% cotton canvas backing and come in medium and large, in designs ranging from Scala, a bold chevron style in four eye-catching colourways including Quince and Teal, to the sophisticated Acacia – elegant intertwining branches displayed in a palette of refined tones. The upcoming 57th edition of Salone del Mobile.Milano promises to be packed with visitors and projects. Taking place over more than 205,000 sqm of net exhibition space and featuring over 2000 exhibitors (22% of them are foreign companies) – including 650 SaloneSatellite designers – the international furnishing sector’s premier platform for quality, innovation and creativity offers an unrivalled blend of products, events and projects. Five exhibitions will take place at the same time at Fiera Milano, Rho, and will be open to trade visitors every day from 9.30am to 6.30pm, and also open to the public on the Saturday and Sunday. Salone Internazionale del Mobile and the International Furnishing Accessories Exhibition – split into three style categories: Classic: Tradition in the Future, Design and xLUX – will be joined by the biennial EuroCucina, its collateral event FTK (Technology For the Kitchen), and the International Bathroom Exhibition, as well as SaloneSatellite. British exhibitors present will include ercol, Duresta, Established & Sons, Gascoigne Designs, Thomas Blakemore and Vispring. This dominant trend for casual comfort was repeatedly reinforced at the event through muted colours and tactile fabrics, while understated grey and pastel shades are expected to maintain their hold on decor during 2018. Luxurious velvets and super-soft ‘touchy-feely’ fabrics remain top choices, too. According to Tom White, design director at Parker Knoll, consumers want a more casual approach to fabrics and colours – specifically soft, chalky pastel tones. Tom says that people are looking for a less formal, easy way of living, that offers deep comfort – and for Nick Murphy at Tetrad, this concept is about delivering “an organic, rather than contrived, look”. So could the popularity of such a quintessentially British product be a reflection of a nation’s reinvigorated sense of national pride? Certainly, many BFM members at the show see being British as a positive marketing tool for 2018, particularly with consumer uncertainty surrounding Brexit. While not everyone feels that flying the flag is a panacea to a toughening economic climate, those who do are united in their belief that British-made can be a major plus, both at home and overseas – particularly in the home market, where exchange rates are now working in favour of British, rather than imported, goods. On the flip side, the current exchange rates are also cited as being among the current trading challenges faced by British manufacturers, having a direct and often significant impact on the price of imported raw materials. And it is widely held that innovation and differentiation are key to surviving any economic storm. Added value was another recurring theme. Another clear trend noted by Westbridge and others is the rising interest in more compact furniture for shrinking room sizes in the new-build sector – along with the growth of apartment living. Chris Fort of Sherborne Upholstery comments: “One problem we’ve noticed with corner group sofas is that the corner section itself can be awkward to manoeuvre into houses, flats and rooms. With that in mind, we’ve designed a corner section which comes in two parts. In the end, doing well in business is about producing strong products which meet the mood and needs of the time, offer the consumer something a little different, and do so at a fair price. Jackie Bazeley, MD of the BFM, agrees that changing consumer tastes are creating an increasingly challenging market. “It is precisely because consumers are so much more discerning that the BFM has launched its Association Code of Practice (ACOP), in order to reassure them that member products are sure, safe and trusted. “By signing up, manufacturing members and potential members have an opportunity to become BFM Approved Members. This certifies that the company produces at least 50% of its products in the UK and conforms to the range of UK legal, fiscal and regulatory requirements as a minimum. In 1988, then-fledgling California furniture brand Maria Yee delivered its first order to Gump’s: a museum-quality reproduction of the iconic Ming Dynasty horseshoe armchair. 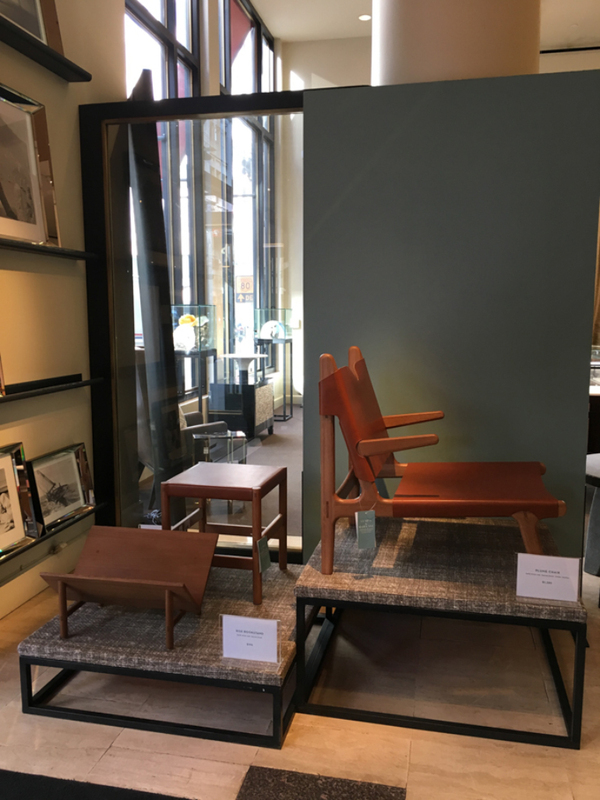 Thirty years later, the chair is still selling, and the bond between the manufacturer and the storied San Francisco mercantile institution endures, quite an achievement considering the era’s volatile business climate. But together they remain. And to celebrate the anniversary, Gump’s hosted a cocktail reception at its 135 Post Street location to kick off a month-long retrospective exhibition, plus a forward-looking trunk show of new designs. Maria Yee’s Elena lounge chair, Metro desk, Arial chair and Katsura bookcase. Photography by Todd Harnjaroen. Running through March 9, the show-within-a-store charts the evolution of the relationship between maker and seller, beginning with replicas of antique Chinese and Japanese designs, and culminating with current examples of Yee’s signature Cal-contemporary aesthetic. These recent additions include a range of furniture and lighting fabricated from Lux, a plant-based composite developed by BASF that’s already used for components by automakers like Mercedes-Benz. Loly bench, Loly floor lamp, Quartz cocktail table and C side table in BASF’s Lux furniture composite by Maria Yee. Photography courtesy of Maria Yee. In furniture manufacturing, it’s promoted as a lightweight and sustainable raw material, promising superior performance and durability in panels that can weigh up to 90 percent less than MDF. 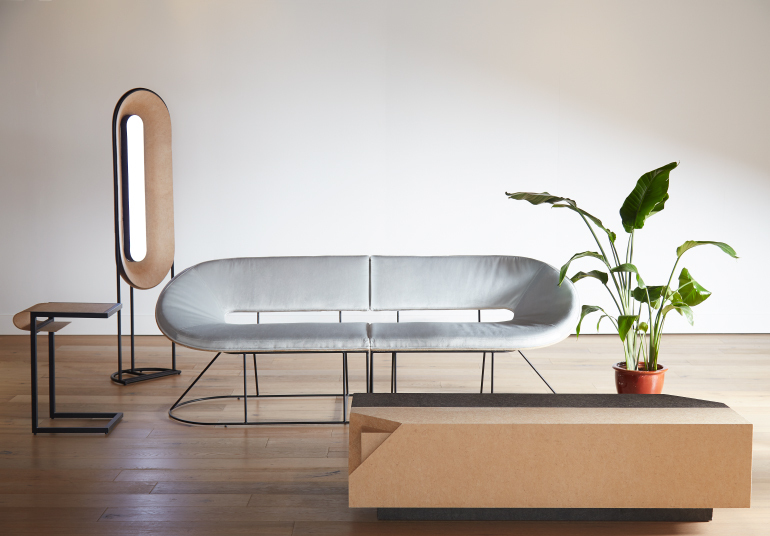 But back to the next generation—the event also marks the retail launch of Sun at Six, the furniture design studio founded in Brooklyn last year by Yee’s son Antares Yee. Utilizing raw white oak and vegetable-tanned leathers, but no screws or nails, the line is devoted to preserving the ancient art of traditional Chinese joinery, but in a naturally modern vein. Sun at Six at Gump’s, featuring Antares Yee’s Rise bookstand in solid white oak, and Plume chair and Juniper stool in solid white oak and vegetable-tanned leather. Photography by Todd Harnjaroen. Alibaba Group Holding Limited, the world’s largest e-commerce platform by volume, has made its first investment in a home furnishings company by purchasing 15% of Beijing Easyhome Furnishing Chain Store Group Co., Ltd.
Easyhome operates four lines of business: home furnishing, finance, consumer products and supply chain logistics. Easyhome makes and sells furniture and home decorations in its 223 stores located in 29 China provinces. For fiscal 2016, Easyhome reported gross revenue of 50 billion RMB, or USD $7.9 billion. Alibaba will pay approximately RMB 5.45 billion, or USD $8.65 billion, for its portion of Easyhome. Jack Ma, founder of Alibaba, has stated that his goal is to use technology to merge online and offline retail business models to invent a paradigm he calls the New Retail, which he defines as using technology and customer data to merge online and offline shopping experiences in virtually every business sector. Alibaba’s goal is to have 10 million businesses and 2 billion consumers worldwide using at least one of its seven online platforms, which include Taobao, AliExpress and Tmall. Major U.S. retailers such as Macy’s already are operating on Alibaba platforms to reach Asia’s burgeoning middle class. Last month, Alibaba was rumored to be exploring an arrangement with Kroger, the second largest retail chain in the U.S. by revenue, although neither company has published a statement verifying the talks.